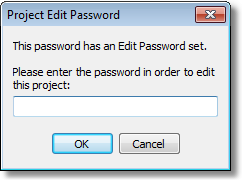 The Edit Password for a project allows the owner of the project to set a password which is required to view and edit the steps of the build in design mode. When you open a project is opened that has an edit password, it will open on the Build Summary screen - clicking the Design tab will prompt for the password. The project can be run without the password. 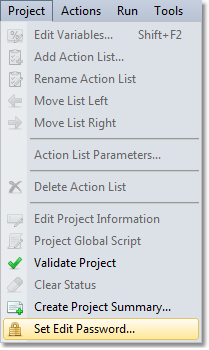 This will bring up the Project Edit Password dialog. Type in the password required to edit the project. To set no password for the project, simply leave the new password fields blank. 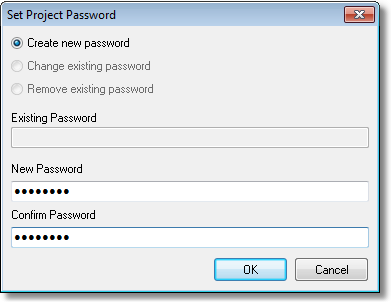 One of the limitations with project edit passwords is that the project file must be saved as a compressed project file (.fbz7) - as this prevents the encrypted password in the project file being removed easily.